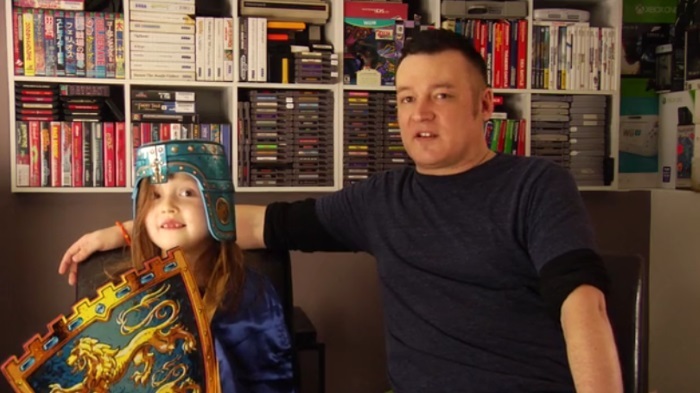 Award nominated game developer, Chris Obritsch shares his love of gaming with his daughter, Madelyn. This love extends to Chris’s favorite game, Ghouls ‘n Ghosts. The two of them play the first stage over and over so she can watch him fight the shielder boss, “Green head.” One day Madelyn told Chris she wanted to be in the game and fight “Green head” herself. Chris did one better and created a new title, aptly named, Battle Princess Madelyn. Causal Bit Games launched a Kickstarter campaign to raise funds for the project. Backers fully funded Battle Princess Madelyn in only two days. It has been steadily destroying stretch goals ever since. It would seem that Chris and his daughter weren’t the only ones looking for a spiritual successor to Capcom’s classic style. When Madelyn had first asked Chris to put her into Ghouls ‘n Ghosts he’d explained that he couldn’t because it wasn’t his game. When he offered to make her a game of her own she told him, “But girls can’t be knights, Daddy. Only boys!” Awesome father that he is, Chris asked her what color armor she wanted. The answer was pink and Battle Princess Madelyn was born. The story follows a young knight in training, Madelyn, and her adorable ghost dog, Fritzy. They must save not only the kingdom, but also Madelyn’s family from the clutches of an evil wizard. Gameplay offers a mix of fast-paced classic arcade action with adventure elements rounding it out. Players can speed through battles or take the scenic route, discovering collectibles and helping locals along the way. The game will feature 10 levels made up of up to 5 stages each full of puzzles, platforming, and various gameplay styles. Once a stage has been unlocked, players can replay it often as they wish. This way they can always go back to search for missing collectibles and other secrets. The Battle Princess Madelyn Kickstarter campaign is still going on with a few stretch goals remaining. The game will release on PC, Nintendo Switch, Wii U, PS4, XBONE and PS Vita thanks to all the backers who’ve supported it. You can check out the pre-alpha story mode sample on Steam and IndieDB.